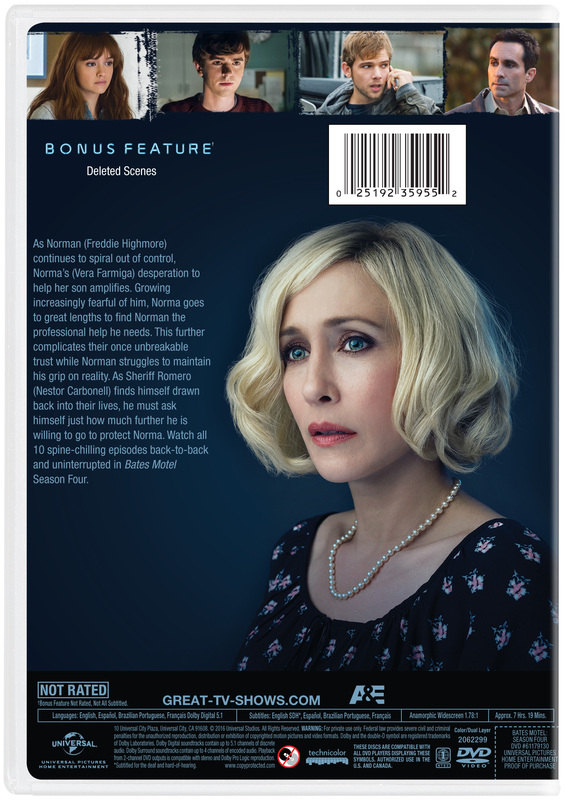 As Norman (Freddie Highmore) continues to spiral out of control, Norma's (Vera Farmiga) desperation to help her son amplifies. Growing increasingly fearful of him, Norma goes to great lengths to find Norman the professional help he needs. This further complicates their once unbreakable trust while Norman struggles to maintain his grip on reality. As Sheriff Romero (Nestor Carbonell) finds himself drawn back into their lives, he must ask himself just how much further he is willing to go to protect Norma. Watch all 10 spine-chilling episodes back-to-back and uninterrupted in Bates Motel Season Four.